Founded in 2017, EarthNow emerged stealth mode just last April. The big idea behind the venture is to provide real-time and on-demand video streams showing virtually any location on Earth, thanks to a network of nearly 500 satellites in low Earth orbit. Each roughly 200-kilogram (440-pound) satellite would be equipped with a system of four independently steerable telescopic cameras, feeding views into a patented edge processing system that could provide resolution as fine as a meter per pixel. There’d also be a wide-angle imaging system to add context. “We’re going to be delivering on the order of 20 frames per second, all the time,” Hannigan said. Hannigan said video views of targeted locations could also be archived for time-lapse comparisons. “You’ll be able to ‘rewind the Earth,’ which will be super-powerful,” he said. The initial customers are likely to be government defense and intelligence agencies, but other applications could include patrolling the oceans for illegal fishing, monitoring farm fields to check crop health, and watching out for natural disasters. “To have a system that can detect a forest fire, literally the instant it starts, is going to save a lot of lives and a lot of money,” Hannigan said. EarthNow isn’t yet sharing the details about its pricing model publicly, but Hannigan said government and commercial users might pay on the basis of minutes per month, or lease capacity on a transponder to secure guaranteed access to an always-on view. The wider public could well get in on EarthNow’s stream via a smartphone app. Hannigan said EarthNow’s mission complements efforts by ventures such as Virgin Galactic and Blue Origin to send passengers on suborbital space voyages. The same limitations rule out being able to read license plates on a car or truck, or even being able to identify the make and model of a vehicle reliably. “Privacy, from that point of view, is just physics,” Hannigan said. OneWeb founder and executive chairman Greg Wyler is an investor in EarthNow, cementing the companies’ connection. There’s another potential connection to Airbus as well: The European consortium could offer EarthNow’s services as part of its satellite imaging portfolio. 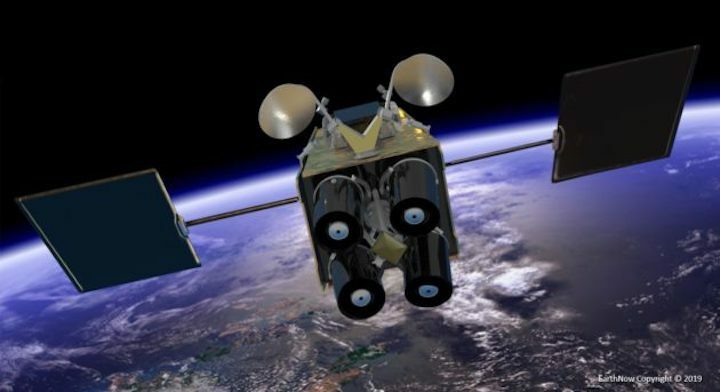 In addition to getting the satellites built, EarthNow will have to fulfill the tortuous legal requirements for putting a satellite broadcast network in orbit. He said EarthNow has also been talking with the National Oceanic and Atmospheric Administration about getting its operating license, although the formal application hasn’t been filed yet. We get to design satellites, and talk to amazing people around the world, and do fun stuff. But it’s hard … You wake up in cold sweats every now and again. Working out the details for ground stations is also on the to-do list. But Hannigan said one of the biggest tasks ahead will be to ramp up EarthNow from its current staffing level of 10 employees to roughly 30 to 40 over the next year or so. Hannigan has had decades of experience working at companies ranging from Intellectual Ventures to Microvision to Teledesic, the ill-fated satellite venture backed by Gates and telecom pioneer Craig McCaw in the 1990s. The fact that Teledesic was headquartered in Bellevue is one of the reasons why EarthNow got its start here. It was Teledesic that first brought Hannigan to the Seattle area, and some of EarthNow’s consultants are old colleagues from Teledesic who now work at a Bellevue engineering firm called Avaliant. For Hannigan, the out-of-this-world thrill of building a satellite network is intertwined with the down-to-earth challenge of building a successful business.